Free show on the salon stage. Green Kill is an inclusive, multiuser space dedicated to the arts. It serves a growing diverse art community. Green Kill hosts poetry readings, theater, film, music and art exhibitions, which include established, outsider or student artists and performers who are focused on the evolution of their work. Green Kill is located in the heart of the Hudson Valley, on Green Kill Avenue, near the Route 32 intersection. A free family friendly pot luck and concert. Open Book trio with Mark Murphy on upright bass. We play from 1:45 to 2:15 but come early and stay late!! 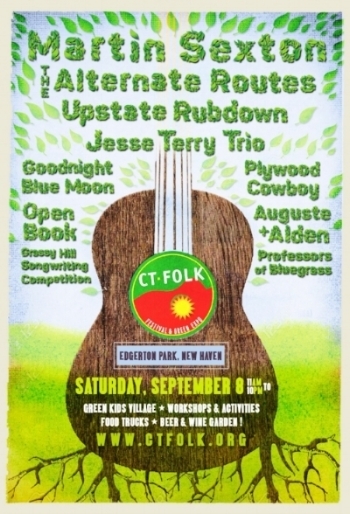 We'll join "Profiles in Folk" host Steve Winters, to play some songs and talk about the beautiful Connecticut Folk Festival! Dan Bonis will sit in on lap steel! Sunset Concerts in Harborfront Park. "Concertgoers are encouraged to bring a picnic supper and their own blankets or lawn chairs. This is a terrific way to connect with neighbors and make new friends, all while enjoying delightful music and spectacular sunsets over Port Jefferson Harbor. There are some terrific food establishments in the area – pick up something to go, and come on down to the Park! Harborfront Park is handicapped-accessible and leashed-dog-friendly." On-air performance and interview on WUSB - from 1-2 pm. Long Island's largest non-commercial, free-form radio station. Facilltators at this amazing, yearly songwriting retreat. "We're very happy to announce that this is our 6th year and we're offering up our 10th and 11th retreats here at Writing a Song That Matters! We're incredibly grateful for the many returning songwriters that have become like family". Facilitators at this amazing, yearly songwriting retreat. "We're very happy to announce that this is our 6th year and we're offering up our 10th and 11th retreats here at Writing a Song That Matters! We're incredibly grateful for the many returning songwriters that have become like family." "Join us for a star-studded benefit for singer-songwriter Dan Bern, who seriously injured his hand in a recent accident, in what amounts to nothing less than every working musician’s worst nightmare. Headlining the concert is James Maddock, who will be joined by blues duo Mule Bone and NYC songwriting legend Richard Julian; along with some of the Hudson Valley’s finest songwriters including singer-songwriter duo Open Book, Fred Gillen Jr., Stuart Kabak, Montgomery Delaney and some other special guests including Dan Bern himself. If you can’t come, please send your donation, in any amount, made out to Dan Bern, C/O Montgomery Delaney, 19 Lakeview Pass, Katonah, NY 10536"
Split bill with duo, Friction Farm (Aidan Quinn and Christine Stay). The Our Times Coffeehouse, staffed entirely with volunteers, has been presenting live music for over 28 years. OTC is dedicated to supporting affordable folk music on Long Island, and over the years has hosted hundreds of outstanding performers in a warm, intimate setting. We're honored to be playing Morrissey Guitars! "The Artisan Guitar Show Concert Series features great concert performances throughout the weekend with highly talented and respected musicians showcasing only the finest instruments being created today. These performances are diverse and include presentations by international performers with an emphasis on finger-style masters, singer-songwriters, harp guitarists, and players who make jazz arch top guitars sing." "Pushcart nominated poet and Calling All Poets VP Glenn Werner joins the evocative musical stylings of Rick and Michele Gedney - Open Book - for an evening performance and conversation. Moderated by CAPS President Mike Jurkovic"
Playing a set at The Woodstock Invitational Luthier Showcase to showcase gorgeous Morrissey Guitars! House concert at the beautiful Mas Pallagourdi in Ceret, France. Full concert! Our friend, Dan Bonis, will accompany on lap steel guitar. 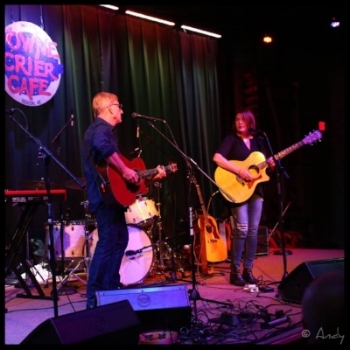 Selected as a finalist in this year’s Grassy Hill Songwriting Competition, Open Book will perform a short set, before a panel of music-industry judges, during the Connecticut Folk Festival & Green Expo, along with four other acts. The winner will perform a short set on the Festival Main Stage later that day, and will be awarded a slot in the 2018 Festival lineup. Benefit concert to raise money for the Austin, Tx chapter of Pets Alive to aid animals affected by hurricane Harvey. With Richard Shindell, Stuart Kabak, Diamond Hotel, and more!